Not many can say that a business trip included dining with soap opera stars from Days of Our Lives. But Rick Postl can—all in the name of recruiting the best and brightest deaf and hard-of-hearing students for RIT/NTID. For 10 years, Postl, senior associate director of NTID admissions, has collected fascinating stories, from the Days of Our Lives dinner that introduced the actors’ deaf son to NTID, to biking through the Greek isles in 90-degree heat a day before attending an international conference, to maneuvering through unfamiliar territory late one evening to visit a prospective student. 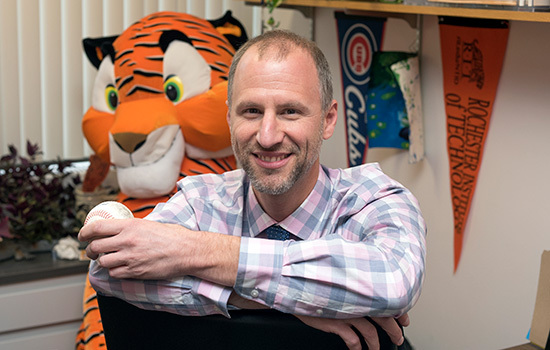 Postl, a 1995 alumnus of RIT’s social work program and a father of three, recalls experiences that astound young deaf and hard-of-hearing students. For example, in 1994, he biked across the country for 62 days with three fraternity brothers. Postl still bikes about 2,000 miles each year. Postl says that during many visits, he is the only other deaf person the prospective students have ever encountered. He believes those interactions are crucial moments for him to demonstrate that deaf people can do anything in a world that struggles to appreciate deafness. Best thing about working at RIT: Working alongside successful deaf and hard-of-hearing professionals, many of whom are alumni, and making a difference for subsequent generations.